Last week was our last week of elementary school (my high schooler got out the week before). My middle child, Chasen, was promoted to jr. high (7th grade) in a very nice ceremony for 130 students. That night, they had a 6th grade dance and my son partied HARD! He had 5 pieces of pizza, 7 brownie bites, 3 sodas and 2 glasses of rainbow sherbert punch. He told me that he danced all night and 4 girls asked for his phone number. I'm in trouble now. We also had our 2nd week of swim team practice. (Monday-Thursday) My oldest son is a jr. coach for the 5-8 year olds. Chasen got his arm brace off last Thursday, so he has yet to swim this year. Sheridan had dress rehearsal and pictures for her dance recital on Sunday. She performed a tap routine to "Sea Cruise" and a jazz routine to "Chapel of Love". On Sunday morning, Chasen left for Boy Scout camp for a week at Camp Chawanakee at Shaver Lake. I delivered a Mad Hatter party on Thursday and hosted a Spa Girls party on Monday. To top it off, my car had $1000 worth of work and was in the shop all weekend. We haven't had much of a "vacation" this week. To reward my very sweet readers who put up with my sporatic postings, I decided to have a giveaway for my 300th post. My Mad Hatter party has been my most popular party since I first introduced it last July. 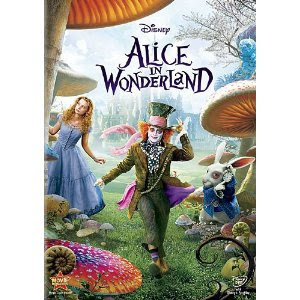 To honor it's success, I am giving away a Alice in Wonderland package! I am including a Alice in Wonderland DVD and some party favors from my very own Mad Hatter party. You can have several chances of winning! 1 entry--Blog about this giveaway on your own blog or post on Facebook-don't forget to leave a link! This will close on June 27th. Thanks so much! I'm a fan on facebook and your blog. I love your party ideas!! following your blog! very cool giveaway! Whew! It sounds like your summer is jam packed....I recall those awesome days of carting my youngins from here to there! Enjoy it....the times zips by waaaay too fast! Sheridan looks darling in her dance costumes! We had 1,500 worth of work done on my van last winter...plus a new battery! My car is 6 years old..with low mileage. It's a van and I use it like crazy for my sales..so we had new belts, hoses, spark plugs....lots and lots of stuff spiffed up to keep her running for a long time (I pray!). You are way ahead of me on posts....I'm at 260 something. I've been so bad about posting...just no time to spend with it! Congrats on your awesome milestone, Donna. I've loved you from the very moment I first "met" you...I truly hope we do get to meet for real one day! We are crazy about Alice in Wonderland around here...I have a little Golden Book I read to the gr. girl..she loves it! SO I hope I win your awesome giveaway! Shameless of me for saying that! NOW, I'm a follower of your blog,too! Sounds like your boy is my kind of party hardy kid! Watch out though, those girls are going to be all over him from now on. He is a darling kid. I love love love red hair and I'm sure I'm not the only one! Our schools don't get out of school until tomorrow. So you have had a jump start on your summer fun! Lucky you. I became a fan on your facebook page and was already one of your blog. Congratulations on your 300th post! Thanks so much for all of the inspiration! I am a fan of yours on facebook! Katy Mc. Ald. And I forgot to put my email on the above, so here is my comment that I have completed the above with my email address included. My blog is private, and right now my FB page is talking about a fundraiser for a friend recently diagnosed with cancer. So after that is over, I will change my FB status. But I do want to tell you how much I enjoy your blog. I have followed for a very long time, without being a "follower". I want to thank you for your inspiration, so much that I am working on starting my own party business here in Colorado. We have nothing like that in my area and I hope that it will be a big hit. Congrats and thanks for 300 posts! It keeps me creating! You are one busy lady! LOVE Chasen's dance party story - especially the girls asking for his number! OH MY! They grow up too quick! Put me in for entry #4....you were just linked on my post!! :) Are you still elated over the Lakers win? Was it wild there last night? Congratulations on your blog success, Donna. You are always an inspiration to me, and I am always amazed at your creativity. Thank you for the opportunity to win this wonderful giveaway. I have been a follower of your blog for quite some time. We miss you on Pink Saturdays. Wowza....what a giveaway! I will enter this on my blog and become a fb fan. My email is fatjakoriginals@comcast.net Thanks for a chance to win this great giveaway!! I became a fan of your blog too :) Thanks again....your parties are phenomenal!!! Also a fan of your blog! Thanx for the chances to win! peachpizazz@gmail.com. 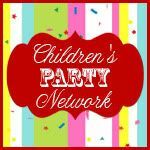 I'm your facebook fan, blog fan, and your giveaway is mentioned on my party inspiration blog as well! I LOVE your Mad Hatter party! I hope I win! Just bragged about your blog on my facebook! Donna! Has your family ever been to Shaver Lake? My family lives in Auberry and Clovis (I live in San Diego County), and that is the best place for a nice get-away! When my brother and I were younger, we would spend the summer up there with our older brother and his family. Wonderful memories! Thankyou so much for this oppertunity. I'm doing an Alice in Wonderland party in Sept. This would be perfect! Love your backyard movie nights.